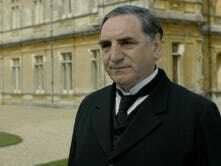 The Downton Abbey Christmas special aired in the U.K. on the 25th, but it won't come out here until March. Doesn't matter. If you have time off and need something to marathon, this period drama is it. No. Stop trying to navigate away. It's awesome. Downton has 16 main characters played by Hugh Bonneville, Jessica Brown-Findlay, Laura Carmichael, Jim Carter, Brendan Coyle, Michelle Dockery, Siobhan Finneran, Joanne Froggatt, Thomas Howes, Rob James-Collier, Rose Leslie, Amy Nuttall, Phyllis Logan, Elizabeth McGovern, Sophie McShera, Lesley Nicol, Maggie Smith, Dan Stevens, Penelope Wilton. The show is set at a country estate in Yorkshire and follows the Crawley family and their servants in the years before and during World War I.
Maggie Smith. She's just a BAMF in general, and especially in Downton. Also, all of the characters are extremely well cast. ALSO, the production value of the show is incredible. The whole first season is about 6 hours long and totally engrossing. Plus, Season 2 is starting in the U.S. on January 8 so this way you'll be ready.